Power Windows is the band’s 11th studio album, released in 1985. It was the first time the band worked with producer Peter Collins. The album was recorded at The Manor in England, AIR Studios in Montserrat and at Sarm East Studios in London. Power Windows launched an era in which the band expanded into new sonic directions, and featured synths heavily. It was also the album where Geddy switched to using a Wal bass, made by a small English company. He’d use the Wal as his main bass all the way through the Roll The Bones album and tour. Neil’s lyrics focused primarily on various manifestations of power–”Manhattan Project” explores the origins and consequences of the U.S. military’s development of the atomic bomb, and “Territories” comments on nationalism around the world. 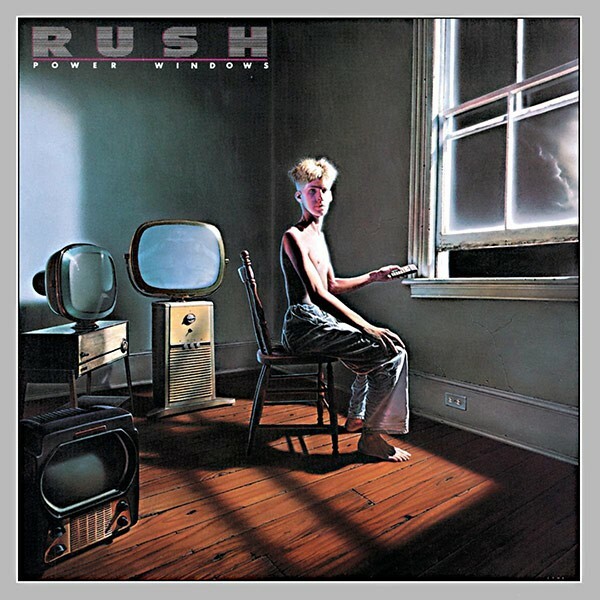 Incidentally, Power Windows was the first Rush album to ever be released directly to CD. However, you’ll be able to get in on vinyl in October of 2015. Busheads and Truckfaces: Tom Whittaker, Pat Lynes, Billy Barlow, Mac and Candy MacLear, Red McBrine, Mike Nervi, Larry Cole and Dennis Cricket. At Elora Sound: Bill, Linda, and Joanne. At the Manor: Lynne, Mike, Barney, Patsy, (don’t bring) Lulu, Jenny, Ian, Paul, Mark, Peter, Frank and Mrs. P., and Willie and Bowzer. In Montserrat: Matt, Yvonne, Malcolm, Paul, George, Desmond, Franklin, Carlton, Leroy, Doreen, Felena, Razor Willie, Bosun, Veston, Fosforus, Scoozball, the King of Antilles Television, and HRH King Lerxst. At Sarm East: Jo, Dave, Heff, Paul, and Rockin’ Dave. In Japan: Mr. Udo, Tommy, Yoshi, Nori, Tets, Kaz, and Tomo. In England: Peter Mensch and Su Wathan, David Mallet, Nikita’s, Bill Churchman, Debbie Collins, Simon Honnor, Mr. Big and the Royal Jamaicans, Zino Davidoff, the Launching Pad, Peter, Jenny, and Joe Flemming, Wimblestein, Rockit Cargo and Fireball XL-5. On the road: Gary Moore band and crew, Red Rider band and crew, Seaship Brokers, Big Al, and the ubiquitous B-Man. On the mound: Smitty, Gully, Bo, and El Animal. At home plate: Ray, Val, Pegi, Sheila, and Bob. Brought to you by the letter “M”. And to the technical assistance of: The Music Shoppe (Thornhill), the Percussion Centre (Fort Wayne), Jim Burgess, Wal Basses, Dean Markley, Tama Drums, Avedis Zildjian cymbals, and – the Omega Concern.